The possibility of Sunday alcohol sales in Flomaton could be in jeopardy due to the religious values of one town council member. Last month, the council voted 5-1 for an ordinance asking the Alabama Legislature to approve a bill that would allow Sunday alcohol sales in Flomaton. 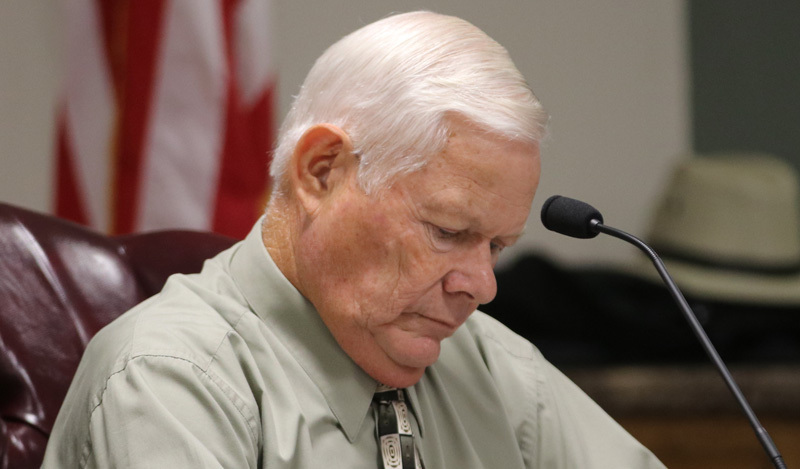 Mayor Dewey Bondurant Jr. told the council Monday night that he spoke with State Rep. Alan Baker, who said the council actually needed to pass a resolution, not an ordinance. The mayor said he was told by Baker that the local legislative delegation would not consider a bill without the full unanimous support of the council. Councilman Roger Adkinson, who voted against Sunday alcohol sales in August, said he would once again vote no because it goes against his Christian values. Other council members did not take issues with Adkinson’s beliefs; rather, they took issue with Baker’s request that the vote be unanimous. The Flomaton Sunday alcohol sale resolution passed with a dissenting vote cast by Adkinson. If the local delegation should sponsor a bill for Flomaton, it would not go before the Alabama Legislature until their next session in 2019. Pictured top: Flomaton council member Roger Adkinson Monday evening. Pictured below: Council member Buster Capps (right). NorthEscambia.com photos, click to enlarge. Nehemiah Chapter 13:15-22 Makes it very clear, no selling or buying on Sabbath Day, it even addresses wine & other things. Jews prepared everything day before, they didn’t buy or sell on Sabbath. That’s what they voted on selling issue, not drinking issue. Keeping God’s Sabbath is so much more than drinking or not drinking on Sunday. God says, Keep it holy. God wouldn’t even provide manna from heaven on God’s Sabbath. He told the Jews to gather twice as much day before Sabbath. If God won’t violate his rule providing manna for his people on sabbath, Should we do any less? If you insist on drinking, buy twice as much on Saturday, that’s your right. Let’s keep Sunday Holy because God kept his day holy. I support Roger. There was a man who once said, “ I rather live my whole life believing and living for God and die and find out that he didn’t exist than to live a life without him and die and open my eyes standing in judgement”. Your Christians values I never questioned. I believe the same as you do. We must stand for what we believe. I have a couple of issues why I wouldn’t vote for it but yes if we stand on Christian Values then I wouldn’t expect you to vote any other way. I respect your decision. I know we have disagreed on many issues but we always agreed that we were brothers as Children of God. Where in the Bible does it say, “thou shall not drink wine or spirits on the day of the sabbath”? Come on, it’s 2018 and why are we mixing religion and politics? You cannot refer to Christmas because you may offend someone so you refer to it as winter holiday but you can throw “YOUR BELIEF” that someone will be violating God’s will by buying alcohol on Sunday? Seems as if the citizens elected Rodger Atkinson on his political stance and integrity to represent them. Apparently this is what he is doing, voting the way his integrity directs him. You and I may disagree, but as long as he is voting honestly, and not in a way to “fill his collard bucket” then he should vote as his conscience directs him. Thank you Mr Adkinson for voting the way the people who elected you to do. i don’t drink or smoke. never have. i don’t think i should push my values on anyone else. if roger can’t vote for it that’s fine. i would have no problem with selling it. this town needs a tax base and jobs. downtown is dead. the streets are in bad shape. houses around town are starting to look bad. crime is up. we have a grammar school that is over 90 years old with class rooms filled to the brim. something needs to be done and i don’t mean more 4 way stops and speed bumps. I do not know if this is allowed to be placed on a ballot so the citizens can make the decision? When elected to an office, you represent the citizens. I personally do not like to see any politician make their decisions based on their personal reasons. Let the citizens of Flomaton make that decision. I am not sure which Christian values would be in jeopardy for allowing sales of Alcohol on Sundays… I am trying to think of any instances or verses in the bible that prohibits it. I guess you could say that it contradicts resting on the Sabbath day… but I would almost bet that the councilman (and everyone else for that matter) does not follow the Book exactly on that either… it is not easy to “rest” in 2018. More than likely, this is just a case of good ole boy traditions, and not concretely established in biblical text. Then why doest he vote to stop liquor sales all together? How many of the councilman are Christians but still voted for it? To say that a persons values need to be left at the door when taking an elected position is as stupid statement. Values is what they campaign on, values is how we decide who we vote for. If a person does not match up with your values don’t vote for him. If he was voted in that implies that his values regarding liquor sales line up with a majority of the voters or at lease that it was a non-issue when voting. I guess it could also be that Flomaton has a bunch of uninformed voters and that’s not his fault. More alcohol is not the correct answer to any question. Most of us have a belief in a religion, but not all do. Flomaton is losing money. Why does one man think he can cause this, do to his personal beliefs? No, it doesn’t work that way. People can just go right across the line and buy their alcohol. I remember when you couldn’t buy alcohol in Atmore on Sunday, so people just drove to the Grey Goose or Piggly Wiggly. two people, each who believe differently. both have a moral viewpoint of a proposed law. one supports it, and the other objects to the new law. question: is the law supreme, or is the moral objection supreme? when you realize that in a multicultural society the moral objection is undermined and not the law, you are in danger of making law that is completely arbitrary. change the law, you change what’s right or wrong, but you haven’t changed what’s moral or immoral. I can show you where the weakness in our society is today, but I cannot understand it for you. Your beliefs and values are just that; your beliefs and values. Government is not ran on an individuals beliefs and values, but what is fair and just for everyone no matter what you believe. If selling alcohol is legal, then it should be legal 7 days a week. No matter what your religious beliefs are, you cannot force that on someone else. Do what you do and be proud of that, but do not infringe on what others do for the sake of what you think if right. you can belive what you want and thats great but they only got to take their money and run across the line and spend their there in florida.its should be your own business what you do.just like gambling ala.doesnt alot it but ala.money goes to the casino indians and helps support mississippi state.as bad as ala.needs schooling funds they should do the lottery. i dont gamble and i dont drink but it should be up to the people not the law is to what you do with your money. >>What a misleading headline! Yes, he is voting based on his beliefs, but he did so before as well. What is wrong with that? 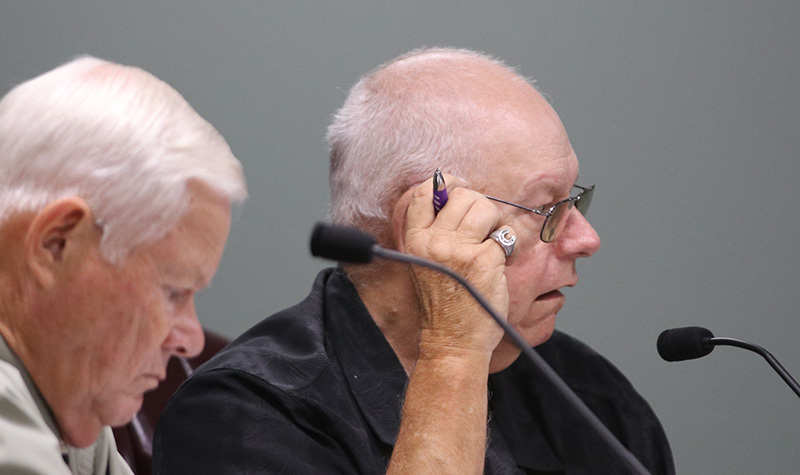 Since Mr. Adkinson voted his values and cast a dissenting vote, that, based upon the mayor’s statement, prevented a bill from behind sponsored which will prevent Sunday sales. Therefore his values jeopardize Sunday sales. Two thumbs up Mr. Adkinson! Thank you for standing up and holding truth to your values and mine alike. I believe God will honor you for that one day sir. I know others will mock you and make fun of you, but stand strong and let the Lord be glorified. For others, I know you don’t understand or have the same values, but there should be less crime/accidents without the sale of alcohol that day. What a misleading headline! Yes, he is voting based on his beliefs, but he did so before as well. What is wrong with that? Don’t we elect representation based on that? Isn’t that what we are supposed to do? Thank you, Mr. Adkinson, for standing on your values, rather than compromising them based on the majority!